We’ve reported on a lot of pre-order bonuses from around the world, including Europe and Greece specifically. 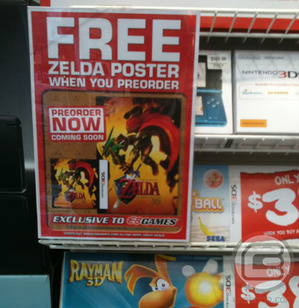 What we haven’t mentioned is for those in Australia, EB Games is giving away posters with pre-orders. As far as other news goes for our Australian viewers, there isn’t a set date for Ocarina of Time 3D’s release, but there is some speculation going around. Finally, the Nintendo Selects range hasn’t yet announced as to whether its making its way down here. First things first, EB Games has been promoting for a while now that all pre orders of Ocarina of Time will come with a free poster (as well as being $10AU off). By the looks of it the poster is official art of Link and Ganondorf however if it’s anything like the poster in Europe, it very well may be double sided. Also based off Europe, we’d assume it would be size A2. As for a release date, officially everywhere is still saying June 2011, with no specific date. People who regularly follow Nintendo’s Australian releases will know that they always happen on a Thursday, which means likely candidates are the 16th, 23rd and 30th. Some retailers are hinting at the 30th, so let’s hope we don’t have to wait that long after everyone else. With Japan and Europe on the 16th and 17th respectively, I’d put my money on the 23rd. We should expect a wait, but hopefully no loner than a week. We’ll keep you updated when there’s an official date, and when there is, you can also be sure that EB Games Melbourne and Sydney, at least, will announce their launch events. Lastly, there is absolutely no word of whether the Nintendo Selects range is going to reach Australia. If it does we can probably expect discounted titles to be in the range of $30 to $50, but not much less. We’ll be sure to keep you informed when we get any official word of either of Nintendo selects or Ocarina’s release date.